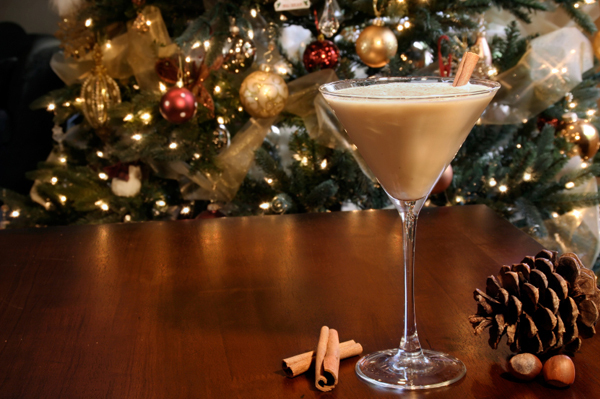 Christmas drink recipes below to bring a bit of holiday cheer to your party. Combine all ingredients in a holiday mug. Top with whipped cream, sugar sprinkles and a maraschino cherry. Serve immediately. Stir the liqueurs together in a mug. Fill to near top with hot chocolate. Top with whipped cream and chocolate shavings. Add a candy cane to the drink for garnish. Serve immediately. This makes a delicious after dinner drink. Wet the rim of the glass with agave syrup then dip into graham cracker crumbs. Place all ingredients except for orange zest in a shaker and shake vigorously. Strain into glass. Grate orange zest on drink and serve. In a glass coffee mug, stir together whiskey, hazelnut liqueur, and Irish cream. Fill to top with hot coffee. Garnish cocktail with whipped cream and serve immediately. This makes an awesome after dinner cocktail. Wet the rim of a martini glass with water and coat rim with crushed candy cane. In a cocktail shaker, combine vodka, creme de menthe, cranberry juice, and ice. Shake until well combined. Strain into martini glass. Garnish with whole candy cane hung on the side of the glass and serve. Remember, these drinks contain alcohol and are for adults only. Posted on May 21, 2016 by Garth. This entry was posted in Recipes. Bookmark the permalink.